The Journal of Geoscience Education (JGE) is the premier peer-reviewed publication for geoscience education research and curriculum and instruction at the undergraduate and pre-college levels. JGE is the publication of record for NAGT, and serves as the only international forum dedicated solely to the publication of research concerning the pedagogy, assessment, and philosophy of teaching and learning about the geosciences. 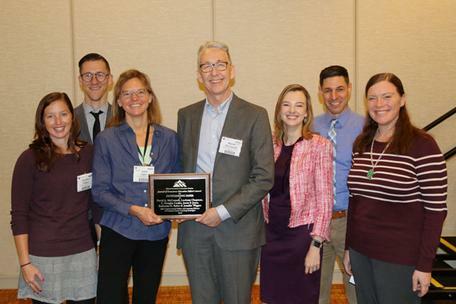 JGE Editor-in-Chief Anne Egger presenting the award for Outstanding Paper to David McConnell and co-authors at the NAGT/GSA/CUR Awards luncheon at the Annual Meeting of the Geological Society of America meeting in Indianapolis, IN, in 2018. In making this award, the nominators noted the explicit effort to link research to practice and make a large literature base accessible to a wide audience. In addition, we are pleased to award a literature review in a year that saw a surge of submissions in this relatively new category. 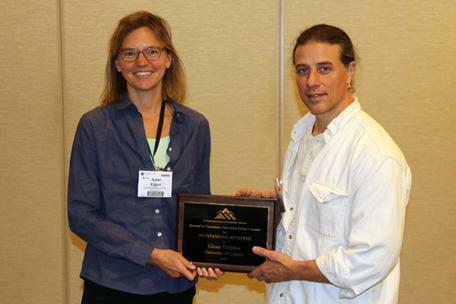 JGE Editor-in-Chief Anne Egger presenting the award for Outstanding Reviewer to Glenn Dolphin at the NAGT/GSA/CUR Awards luncheon at the Annual Meeting of the Geological Society of America meeting in Indianapolis, IN, in 2018. In making the award to Glenn, the nominators noted his long record of thorough and insightful reviews, his repeated willingness to serve as a reviewer, particular attention to providing additional references to authors that would better inform and support their work, and his consistency in turning in reviews early. Because of the broad range of Research, Curriculum and Instruction, and Commentary manuscripts published by the Journal of Geoscience Education, it is impossible to define a set of criteria that must be applied to all papers considered for this award. Rather, it is expected that in order to be nominated, a paper must exhibit, as relevant, at least some of the following characteristics: (1) innovative enhancement of student learning, which is documented and assessed, (2) advancement of the discipline of geoscience education, and (3) broad societal impact of vital and significant high quality geoscience education. The award will be given for papers published during the preceding year (e.g. Fall 2018 award presentation for papers published in 2017). Selection Process: Award nominations are open; they can be made by JGE readers, authors, and Editorial Board members. Each nomination shall be accompanied by a written discussion of how the nominated paper is an outstanding scholarly contribution, exhibiting one or more of the characteristics above (Criteria). Nomination shall be submitted to the Editor-in-Chief. A deadline for submission will be set by the Editor-in-Chief; the nomination deadline is August 1. Nominations for this award will be considered annually, but only given if a suitable candidate is identified. The selection committee will consist of the Editor-in-Chief, two additional JGE Editorial Board members (e.g., Editor of Research, Editor for Curriculum and Instruction, Associate Editors), and one NAGT Executive Committee member. Editorial Board members who nominate papers cannot serve on the Award selection committee that year. This committee will vote on the nominated papers. The Editor-in-Chief manages the selection process. In the case of a large number of nominations, two or more rounds of voting could be used. Authors of all nominated manuscripts will be notified in writing by the Editor-in-Chief after the selection process is complete. Presentation: The names and affiliations of the awardee and all nominees will be published in In the Trenches and NAGT's E-News following the award decision. The Award will be presented by the Editor-in-Chief at a venue where NAGT members and editorial board members are present; for example, at the National Association of Geoscience Teachers luncheon held during the national meeting of the Geological Society of America. This award includes a plaque and a $500 cash prize. Carol J. Ormand, Cathryn Manduca, Thomas F. Shipley, Basil Tikoff, Cara L. Harwood, Kinnari Atit, and Alexander P. Boone (2014) Evaluating Geoscience Students' Spatial Thinking Skills in a Multi-Institutional Classroom Study. Journal of Geoscience Education: February 2014, Vol. 62, No. 1, pp. 146-154. doi: http://dx.doi.org/10.5408/13-027.1. Anthony D. Feig (2013) The Allochthon of Misfit Toys. Journal of Geoscience Education: August 2013, Vol. 61, No. 3, pp. 306-317 doi: http://dx.doi.org/10.5408/13-004.1. Tamara Shapiro Ledley, Michael R. Taber, Susan Lynds, Ben Domenico, and LuAnn Dahlman (2012) A Model for Enabling an Effective Outcome-Oriented Communication Between the Scientific and Educational Communities. Journal of Geoscience Education: August 2012, Vol. 60, No. 3, pp. 257-267. doi: http://dx.doi.org/10.5408/11-234.1. Scott K. Clark, Julie C. Libarkin, Karen M. Kortz, and Sarah C. Jordan (2011) Alternative Conceptions of Plate Tectonics Held by Nonscience Undergraduates. Journal of Geoscience Education: November 2011, Vol. 59, No. 4, pp. 251-262. doi: http://dx.doi.org/10.5408/1.3651696. The quality of the Journal of Geoscience Education is dependent on dedicated reviewers and editors. JGE Editorial Board would like to recognize those reviewers who: (1) provided reviews of exceptional quality, (2) completed reviews more quickly than average, and/or (3) completed more reviews than average. The award will be based on the quality and quantity of reviews completed in the past year. Process: JGE authors and members of the Editorial Board may nominate reviewers for this Award. Each nomination shall be accompanied by a written discussion of how the reviewer made an outstanding contribution to the peer-review process of JGE, as outlined in the selection Criteria. Nomination shall be submitted to the Editor-in Chief. A deadline for submission will be set by the Editor-in-Chief; the nomination deadline is extended to August 1.. Nominations for this award will be considered annually, but only given if a suitable candidate is identified. The selection committee will consist of the Editor-in-Chief, two additional JGE Editorial Board members (e.g., Editor of Research, Editor for Curriculum and Instruction, Associate Editors), and one NAGT Executive Committee member. Editorial Board members who nominate papers cannot serve on the Award selection committee that year. This committee will select the Award recipient by vote. The Editor-in-Chief manages the selection process. In the case of a large number of nominations, two or more rounds of voting could be used. All nominated reviewers will be notified in writing by the Editor-in-Chief after the selection process is complete. Presentation: The names and affiliations of the Awardee and all nominees will be published in In the Trenches and NAGT's E-News following the award selection. The Award will be presented by the Editor-in Chief at a venue where NAGT members and editorial board members are present; for example, at the National Association of Geoscience Teachers luncheon held during the national meeting of the Geological Society of America. This award includes a plaque and a $500 cash prize.